The Pineberry is a strawberry cultivar. They were publicized in Germany in April 2009, as Ananaserdbeere, or pineapple strawberry. It is a hybrid of Fragaria chiloensis, originating in South America, and Fragaria virginiana, originating in North America, the same parentage as the garden strawberry Fragaria × ananassa. A pineberry is smaller than a common strawberry, measuring between 15 to 23 mm (0.6 to 0.9 in). When ripe, it is almost completely white, but with red "seeds" (achenes). "The fruit flesh can range from soft white to orange and is very fragrant with a slight pineapple flavor," said Greg Goddard, the co-creator. The plant is disease resistant, but is not very profitable, due to small-scale farming, small berry size and low yield crop. The Pineberry has been marketed to European restaurants, bakeries and wholesale markets. The berry has been dubbed the Pineberry for the UK market where it became available in 2011. White strawberries are not rare; garden supply stores in the UK have other white varieties of strawberry called White Soul and White Delight. Unlike the pineberry, these however are Fragaria vesca cultivars; the strawberries these plants produce are generally smaller and more fragrant. 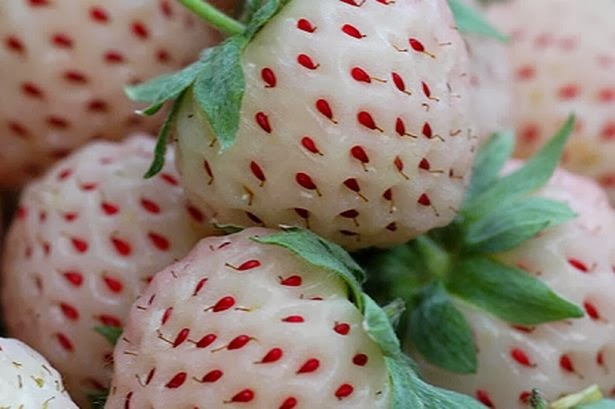 Pineberries were nearly extinct until 2003, when Dutch farmers saved the plant. The farmers found the plant in France and decided to grow it commercially. As a result of many selections over time, the plants they found yielded only one or two berries per plant. The farmers took cuttings and grew hundreds of plants and selected the healthy ones. This was repeated for six years until they had healthy plants.